Since the last chart, silver has broken out of the pennant formation (on the short-term chart), and is looking really good. There was a significant peak in the Dow (1973 and 2007) between point 1 and 2 of both fractals. 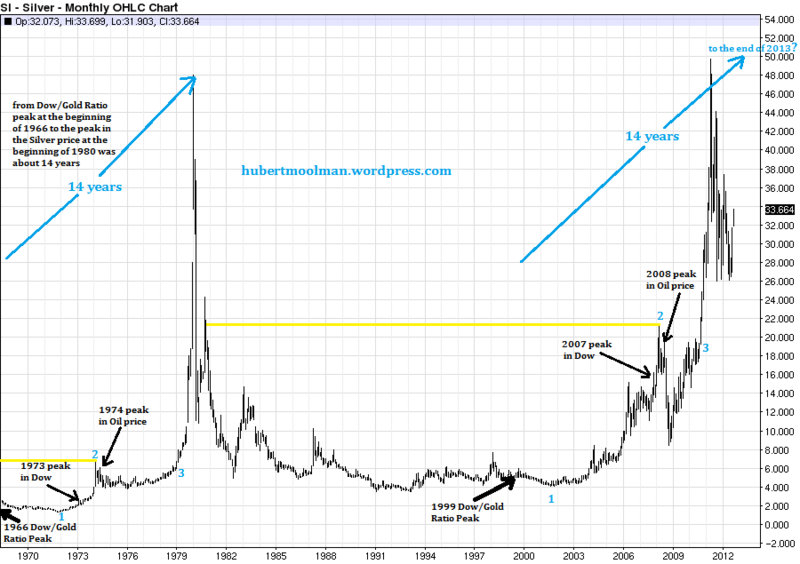 Also, point 1 on both fractals represents a significant bottom for silver after the peak of the Dow/Gold ratio. After point 2, on both fractals, the oil price made a significant peak (1974 and 2008), about 8 years after the peak in the Dow/Gold ratio. Thanks to this similarity in events, as well as the similarity in sequence, I was able to identify the great possibility for significantly higher silver prices, back in October of 2010. This was a very clear signal that higher silver prices were coming, and that is exactly what we got, when silver moved to $49. However, this run is not over yet. The move from $17, when silver broke out of the triangle (at point 3 of the second fractal) to $49 was just the first part of the move. In my opinion the biggest and best part of this move is still ahead. In my long-term fractal analysis report on silver, I have presented a lot of technical and fundamental evidence to support my opinion for higher silver prices over the coming years. This article was posted in dow, Fundemental Evidence, Silver, Technical. Bookmark the permalink. Follow comments with the RSS feed for this post.Comments are closed, but you can leave a trackback: Trackback URL.